Across the world, indigenous peoples face arrests, harassment, torture and death in the name of nature conservation. 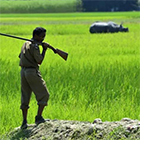 The Kaziranga National Park in India is but one infamous example of this inhumane tendency. Fifty people have been extrajudicially executed by park guards at the infamous “shoot-to-kill” national park in the last three years. Tribal people face being shot, beaten, tortured and killed at the hands of heavily armed park officials. Last year guards shot a 7 year-old boy who is now maimed for life. This violence is being done in the name of conservation. Big conservation organizations including WWF, the Wildlife Conservation Society, the Nature Conservancy and Conservation International, among others, have ignored demands that they condemn the practice.